There are few people who could so seamlessly connect lotions with art as Jeff Koons. So it kind of makes sense that Kiehl's, the high end skin and hair care company, and the outrageous artist have joined forces to make a christmas gift. 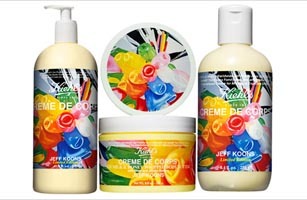 Their limited edition Crème de Corps Holiday Collection puts some of Kiehl's more popular emollients into bottles with labels by Koons. As a bonus, 100% of the profits  up to $200,000  from the items are being donated to the International Center for Missing and Exploited Children, a charity that has been a Koons favorite since he lost his legal tussle with his ex-wife Ilona Staller over their son Ludwig. And don't worry, unlike much of Koons' work, the labels are very grandma-friendly.